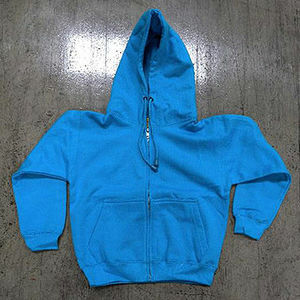 The sweatshirts have a drawstring through the hood which can pose a strangulation hazard to children. This recall involves about 17,000 children's sweatshirts and jackets sold in sizes XS to XXL in navy blue, black, brown, pink, red, white, green, grey, blue, yellow, and orange. The recalled garments contain the following embroidered logos: "Montauk" (as shown), "Avalon," "Stone Harbor," "Cape May," "Sea Isle," "Ocean City," "Alaska," "Nantucket," "Maine," "Long Beach Island," "Lavallette," "Seaside Park," "Newport," "Monterey," "Carmel," "Skaneateles," "1000 Islands," "Block Island," and "Seattle." The following retail and gift shops: Montauk Clothing, Riptide East, Shirt Shops of Cape May, Summer Sweats, Rip Current Sportswear, B&B Dept. Stores, Trapper Jack's, Annie & The Tees, Emporium, Inc., The Trading Co., Mackerel Jack's, Carmel Classics, Rolands, The Ship Gift Shop, Star Dept. Store, Seattle Shirt, and Simply Seattle from September 2005 through September 2009 for between $25 and $35. Most stores are located in New England with two stores each in Seattle, Washington, and Alaska. Immediately remove the drawstrings from the sweatshirts to eliminate the hazard, or return the sweatshirt or jacket to the store for a full refund. For more information, contact Century 21 Promotions at (800) 935-2100 between 9 a.m. and 5 p.m. PT Monday through Friday.